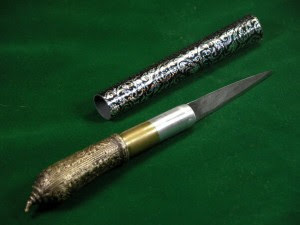 Siam Carving Academy offers some great products on sale at their Products page here. I have posted some details of their products with the Images directly linked to their Products page so that it will be easier for you to read more about them and also buy them. Have a great time. They also have some great Offers! Please check out for the prices and availability on the page you are directed to. In fact all the Text Links and images that I have shown below go to the same page but I have given the page links to all images so it becomes easier for the reader. 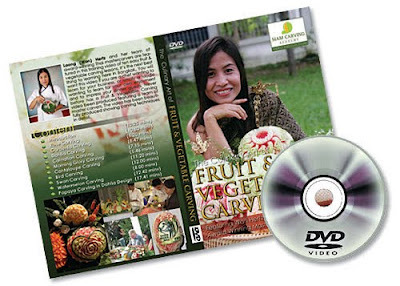 Wan Hertz and her team of award winning thai master carvers are featured in this step by step training video of ten fruit & vegetable lessons. It’s the next best thing to learning here in Bangkok. You will love this video if you are a chef wanting to learn for your business or simply a foodie wanting to learn for your own enjoyment and to impress your guests. 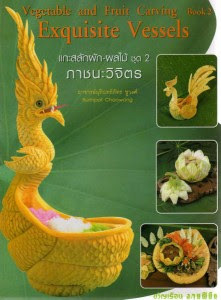 Never before has a Fruit & Vegetable Carving video been produced featuring a team of mastercarvers from Thailand. The video has been beautifully produced showing carving techniques in very close up detail. 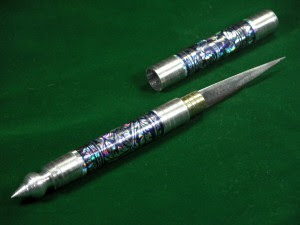 Their Knives are used by beginners and professionals carvers. After each use wash the blade with soap and water, and dry thoroughly adding a drop of vegetable oil. Each knife comes with fine sandpaper for sharpening. 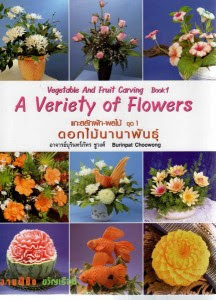 104-page illustrated instruction book on carving flowers from fruit and vegetables step by step. 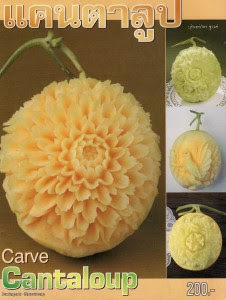 58-page illustrated guide on carving cantaloup step by step. 127-page hardcover illustrated guide to fruit & vegetable carving step by step. Have a great time until I go out and get you all some more wonderful information! 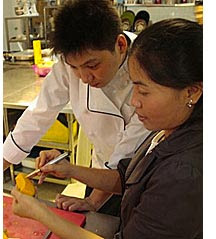 Siam Carving Academy offers great Onsite Training. I have posted the information from their Onsite Training Page directly here with direct links to their site for your benefit. Hope you make best use of this facility. Want your staff or group to learn, but can’t afford the time or expenses traveling to Thailand? The solution is…Avail our Onsite Training! Bringing a Professional Master Fruit & Vegetable Carver to your group will get the same professional training without the high cost and hassle of traveling to Thailand. Consider onsite training from the Siam Carving Academy. We’ll come to many locations and bring training right to your business. Save time and money with convenient, high quality training. Quality: Hands-on, top-notch professional training from the best mastercarvers using the same training curriculum as in Thailand. Convenience: You can select the dates and hours that are most convenient to hold training at your workplace. Price: It will be substantial when compared to class training in Thailand. Please contact larry@siamcarvingacademy.com or call for details. Class size: We give individualized instruction to each student limiting the class size to a maximum of 10 students. In my next post I will dedicate the information towards their Products and also take you on a trip to their Galleries which display such wonderful work of art! 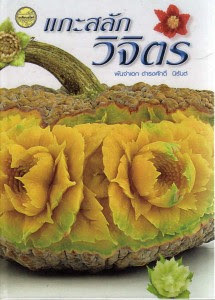 As I usually do I was scanning the web for some wonderful sites which I could share with you wonderful patrons of the Art of Vegetable and Fruit carvings and happened to find this wonderful Academy - Siam Carving Academy. In my effort to bring you all the best of this wonderful Art of Carving I have dedicated this post and the next few posts to this wonderful Academy which has so much to offer for the Enthusiasts and patrons of Vegetable and Fruit Carvings. I have posted a section of their About us for your review and linked all site links directly to their site with due credit as you will be able to get their information first hand. I am sure you will all take full advantage of this site, their online training, the products they offer and of course learn from some of their best Trainers and Fruit Carving Masters! Have a great time. The Siam Carving Academy is recognized worldwide as one of the best places to learn the culinary art of Fruit & Vegetable Carving. We provide fruit and vegetable carving courses held in Bangkok, Thailand and we also provide onsite training in locations worldwide. 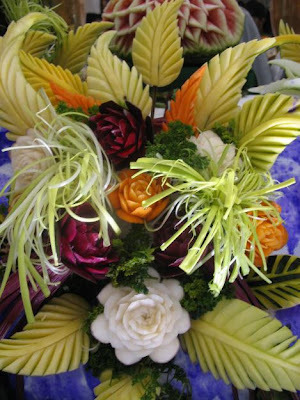 In addition to teaching fruit and vegetable carving we also create spectacular fruit and vegetable carving presentations for your special event. 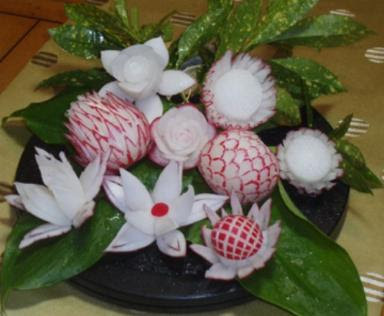 Our courses are led by International award winning and distinguished Master Carver Laong (Wan) Hertz, who has received a Gold Medal Award from Salon Culinare and 1st Place Award in the Brazilian Watermelon Carving Cup. 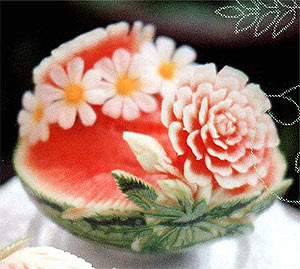 What is Fruit and Vegetable Carving? 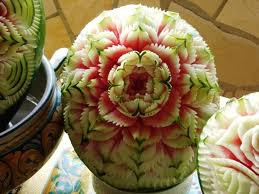 The traditional culinary art form of fruit and vegetable carving is known as Kae Sa Lak in Thailand. 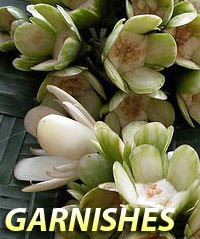 It is been around for seven centuries and is used for the purpose of entertaining guests and showing respect. This culinary art form is being seen much more today in hotels, cruise ships, finer restaurants, and at special social events such as weddings, corporate functions, exhibitions, trade shows, product launches, grand openings, conventions, etc. 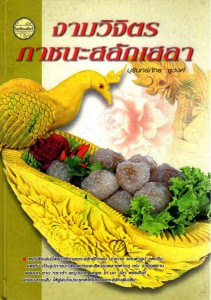 When the 60th anniversary of the King of Thailand’s asent to the throne took place, dignitaries, kings, presidents and prime ministers from all over the world enjoyed a lavish dinner adorned with exquisit Fruit & Vegetable carvings. Although it requires special skills and techniques to master correctly, our method of teaching provides students to carve in the shortest period of time. We provide courses for beginners, intermediate and advance students. This is only a part of the information about this wonderful Academy I will post more information in my next post as this was only an Introduction. For more information and to contact them please click here. The Best part about Nita Gill's Site is that she has a host of services offered on one site. 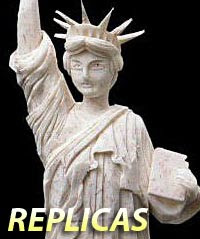 Courses, DVD, Tools Sets, Videos, and all that one would want on a Great site dedicated to Vegetable and Fruit Carvings. One such section is the Tools and Tool Set Section where you will find various Tools for sale. Check out these wonderful offers at her site. Just Click on the Image or link and it will take you to the respective pages. If you like the product just click on the "Add To Cart" button on that page and you will be taken to the Check out page for billing. Excellent for peeling melons and other fruits in preparation for carving. Imported from Thailand. Corrugated U-Cutters with DVD Lessons Corrugated U-Cutter set, perfect introductory kit for beginners. 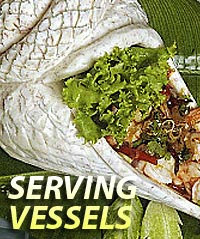 (These lessons are included in the Vegetable and Fruit Carving 101 course). Onion Lotus DVD, Fun with Peppers DVD and fruit carving knife. Also great for beginners. (These lessons are included in the Vegetable and Fruit Carving 101 course). I am sure you will find these tools very useful and also the DVD will help you in trying to understand exactly how these tools can be used. Have a great time carving! 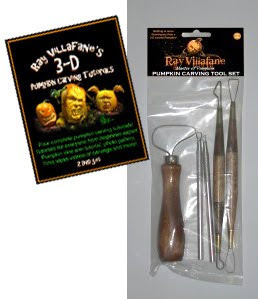 I am not going to say any more but post Excerpts of details of Ray Villafane's 3-D Pumpkin Carving Tutorial Details here as it is seen on Nita's Site. You may click on the Images or the Linked Text to go directly to the page on her site. Nita says...." Ray Villafane reveals his pumpkin carving secrets in his brand new 2 DVD set that is about to be released. This October Ray Villafane can be seen in the Wall Street Journal, the Martha Stewart Show and at Heidi Klum’s Halloween Bash. he is the undisputed Champion Pumpkin Carver on several Food Network Pumpkin Carving Competitions. 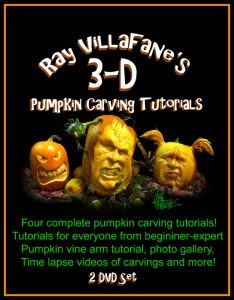 And now, Ray Villafane has a brand new DVD set of pumpkin carving tutorials for pumpkin carvers of all skill levels. And for a limited time, you have the opportunity to learn Ray’s secrets in a LIVE pumpkin carving class taught by Ray Villafane in person! 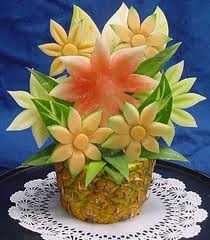 If you are looking for a great Online Course in Vegetable and Fruit Carving Nita Gill offers you a great choice. She has two courses designed for Beginners that you can take full advantage of! Take your pick from any of the two Courses and make yourself and your guests proud! Click the Image or link below to go to the Course page and listen to what Nita has to say about this course and what the course offers. As Nita rightly says "Create Vegetable and Fruit Carvings that your Guests will Talk about and Remember"
Vegetable and Fruit Carving Course 101 will have you making impressive garnishes and centerpieces in no time. I have purposely not posted any of the wonderful carving pictures here on my blog as I would like you to go to her site and see the carvings personally. They are so exquisite and delicately carved that it will motivate you to do the same and I am sure it will not be long before you click on the "Yes I want to get started Now" button and register for the course! So have a great time. While browsing through the internet for the best of the information available on Vegetable and Fruit Carvings and also for those Artists that are truly an asset to this art, I happened to be reading this wonderful site of Nita Gill - Vegetable Fruit Carving.com. I was stunned by the exquisite content of the carvings, the fantastic videos she has posted and the obviously the work that she is doing. As a true appreciation of her art and her site I am posting these series of posts dedicated to this great artist and her work. As I always have done, I will be giving you the direct links to her site, and only the images on her site are used to guide you to the subject. I just couldn't get off her site, and I am sure you too will be glued to her site. She has so much to offer, through her classes, online classes, videos, shop, and others so I thought of creating one post for every special offer that she has on her site to enable readers to be able to get directly to the page she offers those wonderful offers. So just keep a look out for the Topic of my post which will be the direct link to her page. I salute this great artist and am sure that this small effort of mine to promote her work will be appreciated. You can read more about these Carved Vegetable and Fruit Thanksgiving Centerpieces at the link below. 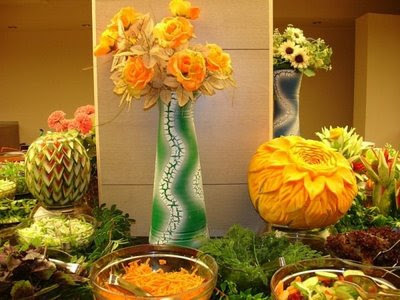 Carved Vegetable and Fruit Thanksgiving Centerpieces. You will be able to see some great carvings and also videos at this page. Watch these great videos created by Nita Gill. A quick centerpiece idea for Thanksgiving dinner. These birds made from acorn squash and yellow crookneck squash are pretty decoration to add to any autumn or winter dinner table. The acorn squash can be carved with feather and tail design or left uncarved. Either way, these squash birds look graceful and elegant. I am sure you will have a great time watching her work. Have a great time. What could be more better than watching this wonderful video on Ice Carving by none other than Paul Germain from the Academy of Ice Carving and Design - AICD. This is a classic case of "Seeing is Believing"
I will not write more about the video and allow you to enjoy the contents. I am sure you will be stuck to the video in awe of what can be done with Ice. It was just stupendous, and awe inspiring work of art. I will be checking out for more such videos of Paul Germain and other artists so keep watching. In my previous post you read only about the brief introduction and general overview of this wonderful Academy. This post I created specially for those who are directly interested in learning through their fantastic Training Programs. Certificate Plaques indicating the number of hours of training successfully completed at AICD are provided to assist graduates with the documentation needed for continuing education hours and professional development units often required by teacher credential programs and distinguished professional associations such as the World Association of Chefs Societies, the American Culinary Federation and the National Ice Carving Association. What more can you ask from a premier Institute like the AICD?....see this! AICD's Lifetime Certification Guarantee: Due to AICD's proven "hands on" approach to comprehensive instruction and its stature as a private school, you can earn each level of AICD Certification for life with no certification fees, no yearly fees, and no membership requirements. To maintain the integrity of AICD's educational programs, activities such as attendance at conventions, competitions, and related activities cannot be counted for receiving AICD Certification. A carver's unique experiences may, however, qualify as the prerequisite for enrolling in AICD's advanced instructional programs. I am sure that with so much to offer with such conviction and Accreditation no student of Ice Carving will miss out on this wonderful opportunity. Have a great association. Well I have been primarily posting on this Blog articles and information about Vegetable and Fruit Carvings, but when I also saw some wonderful Ice Carvings during my review of various sites I was awestruck by the creativity, the challenge and the intricacy of this art, especially with the medium being so fragile and perishable. I have sometimes during my writing posted a few details about Ice Carving, but when I came onto this particular site, I was amazed and thought of introducing it and promoting it to my readers. I am sure many of the readers may be aware of this site, but for the benefit of the common reader and the layman I thought it prudent to publish about the Art of Ice Carving and Designing. I am sure you will all like this information. I will not say much or write much about the institute that I am referring to as it is just too good to say, and leave it to the reader to access the details directly from the site. I have picked up excerpts from the site and directly linked the details to the site so that you can access the details directly. ACADEMY OF ICE CARVING AND DESIGN"
There is so much you can find, learn and participate on this site that I will only leave you with the links to the direct pages of this wonderful site. Help yourself to the information as I am sure you will find it hard to leave the site, and by the time you have read through the site you would have enrolled yourself for some great course or the other. Paul Germain, President of AICD, is internationally renown for being a highly creative, enthusiastic, and inspirational Master Teacher, Ice Sculptor, and Food Artist. 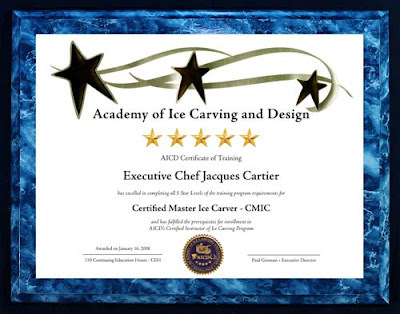 He has been developing, researching, and sharing innovative carving techniques and instructional methods for both the commercial ice carving and culinary industry around the world for over 35 years. 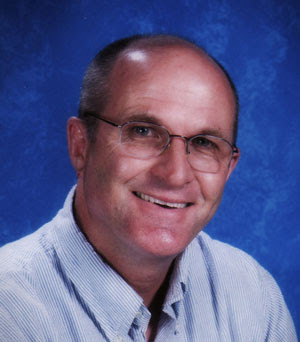 Read more about him at About Paul Germain, President of AICD. I am sure you will all love this site, and take up this new art seriously. Wish you all the best! 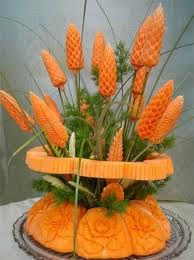 This time I have decided to only post images of some Exquisite Vegetable and Fruit carvings as a Feast for your eyes. I was browsing through some resources and found some of the most delicate and painstaking carvings which I thought I would share with you. 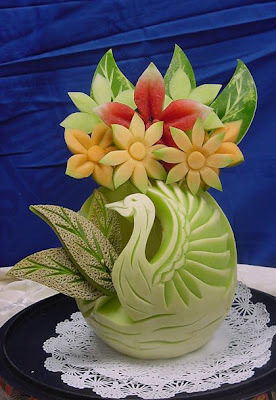 Please note that these images have be posted only to give an idea as to what sheer dedication for the art and lots of patience can do into converting simple Vegetables and Fruits into works of art. Have a great time watching these fantastic carvings. 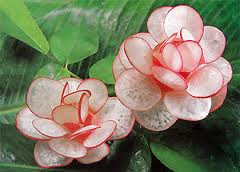 I am sure you will like them. So here is a panorama of this Art. I have given the direct links of those respective sites from where I say the carvings to the Image so you can just click on the image and go to that respective site to see more images! Some more great images with respective links in my next post. Have a great time.